Hello! In brief, we can chalk up my absence to pneumonia. I won’t go into detail because those weeks are lost. But I have three things that made the whole experience slightly more bearable. Aside from a variety of western and non-traditional medicines, I found some comfort in: Bronchial tea, herb throat drops with an effervescent center, and the best travel pillow ever (even though I stayed within my own four walls). This year I want to make something each day. By hand. I’m trying to create more than I consume. I want to make intelligent mistakes (craft-wise)—the kind that I can articulate to you so you can avoid them. I want to create with abandon. 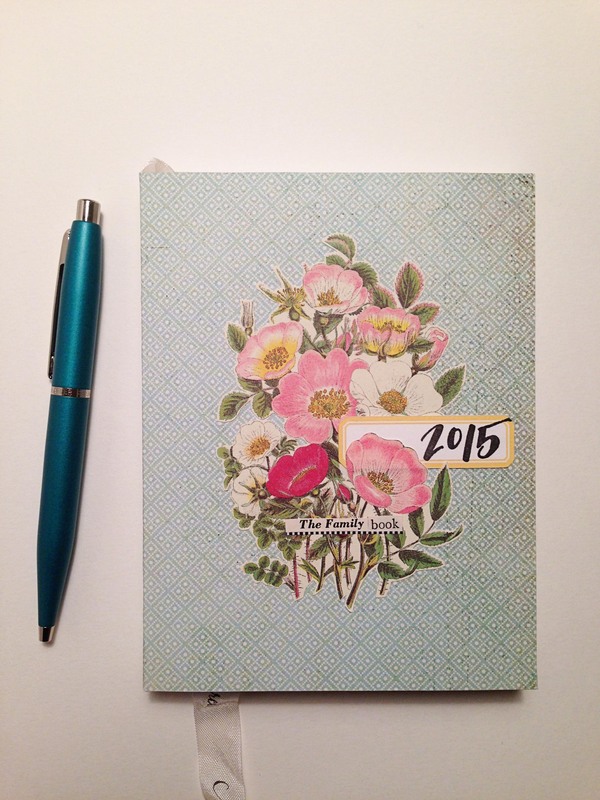 I purchased a year-long goal calendar from Elise Cripe. If I make something, or make progress on something, the circle gets filled. Perfection won’t happen here, as I am a realist, and I know that one good flu bug could wreck this house for weeks. Or a crazy day pops up. Or a friend is visiting from afar. But my little mantra for 2015 is: create daily. All this creating feels great, and freeing…maybe a little too unstructured. So I’m adding in a small caveat: prizes. In addition to creating with abandon, once weekly, I’ll craft a prize. 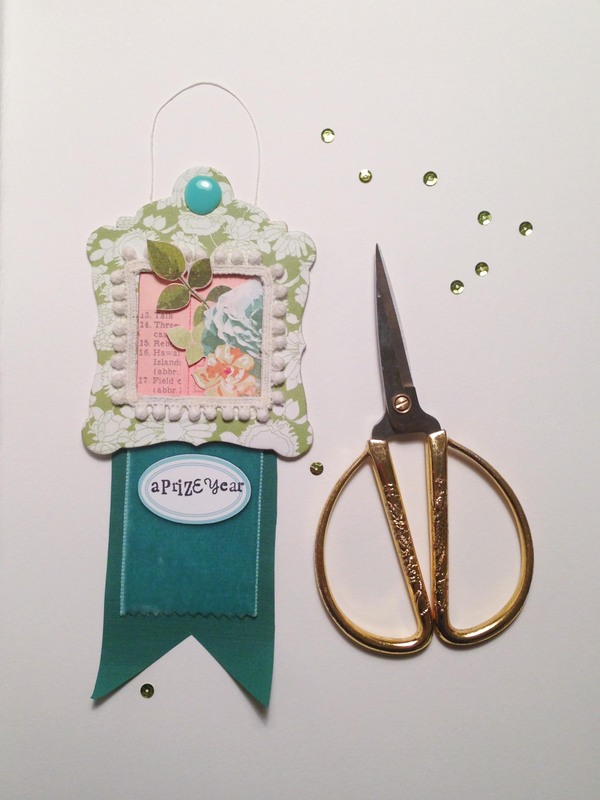 What: A Prize Year is a year-long project where I am creating a prize ribbon once a week. At the close of 2015, I’ll ideally have 52+ prize ribbons, and more importantly, have experienced the creative ebbs and flows of a year-long endeavor (simple, though it may be). When: weekly, in 2015. Weekly feels do-able. I will reward myself for completing each prize with a notation on my calendar. 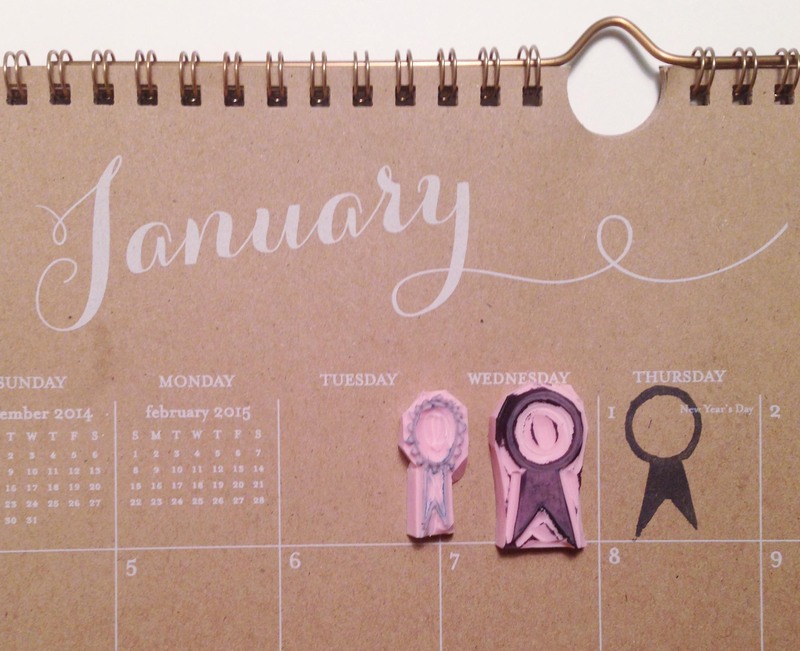 I bought a very simple kraft paper calendar, and I hand-carved a tiny prize-shaped rubber stamp. This is a creative exercise for me. The weekly format and prize form provide a structure, but beyond that I will try to not limit myself in regard to materials. I could, of course, assemble 50 prizes now, and dole them out over the year. But I’m really interested in the process. I’m curious to see how the project evolves, and changes. I’m uncomfortable with the idea of a year-long commitment, creatively, and that is precisely why I’m pursuing it. Who: Me, the one-woman hand-making, prize-loving crafter. And YOU, if you’d like! (if you use Instagram, tag your photo to #aprizeyear, or send me a link; I’d love to see your prize creation). So, that’s my windy road map for 2015. Care to join me? the antidote for blocked artists. 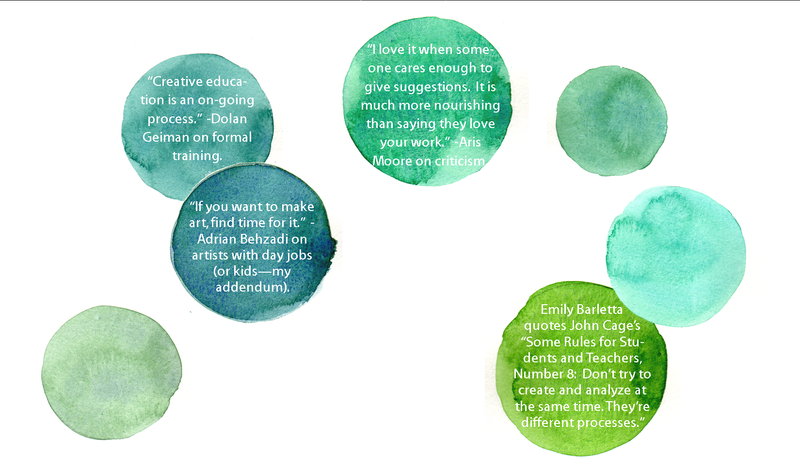 Advice and Projects from 50 Successful Artists. This project, coming from Danielle Krysa’s own desire to become unblocked, cannot—should not—be devoured in one sitting as I tried to do. There’s just too much mining, too much good art, too many references sending me to Google this admired artist in Oakland and that series of bird collages from the guy cutting paper in the Midwest. Danielle has chosen artists from a wide spectrum of disciplines (painters, illustrators, collage/mixed media, multidisciplinary, photography, ceramics, embroidery, paper cutting, installation). Each entry for the 50 contributors has a short bio, a selection of work, and a shovel-full of questions about his or her particular creative process. Danielle uses some questions on repeat: When did you first feel like an artist? Or how do you feel when you are in your creative zone? But there is tailoring too. Questions like: What are your tips for dealing with collages that are giving you trouble? Do your commissioned projects drain or fuel your personal work? You will surely find other thought-provoking lines that resonate with you and your process, whatever your medium. And there are a handful of artists who do not feel the pressure of a block—they’ve made a sort of peace with their muses, and allow that non-art time to serve as a transition, a breathing space between major projects. But all 50 artists give you, the reader, a Creative unBlock. These delicious prompts &/or exercises are thoughtful nudges or smack-in-the-pants cattle prods to stir you up and get you MAKING. They range from breaking out of a rut by going for a walk and documenting your findings, or completely destroying a piece that has failed—or one that you love!—and rebuilding it. Some prompt you to leave art out in public, to be discovered and delighted by a stranger. There are challenges to help you mix things up, like move out of your natural medium and try something new. Catalog particular spots around your house, or arrange items pleasingly. Create a series of somethings. (I’m being intentionally vague because if you’re a working artist, writer, or maker, then you know the vacuous place called Uninspired. And this book would be a very handy antidote to have around when you’ve found yourself untethered in that barren land. And if you don’t know this space, then, as one artist’s claims: you’re lying). Though I do wonder what Danielle did regarding blocks before she amassed this collection of unblock exercises…. Danielle is no slouch to the visual world. Her blog has become a spring-board for many up and coming artists, and for art-loving people who like to put interesting work on their walls. Further, Danielle is making superb art as well, though she strikes me as veritably humble about it. I’m not an art critic, but I know what I like, and I very much like what Danielle creates, especially her crisp collage and painted art with embroidered pops of color and texture. Danielle vows to work through each of the challenges included in the book, and I can’t wait to see the fruits. 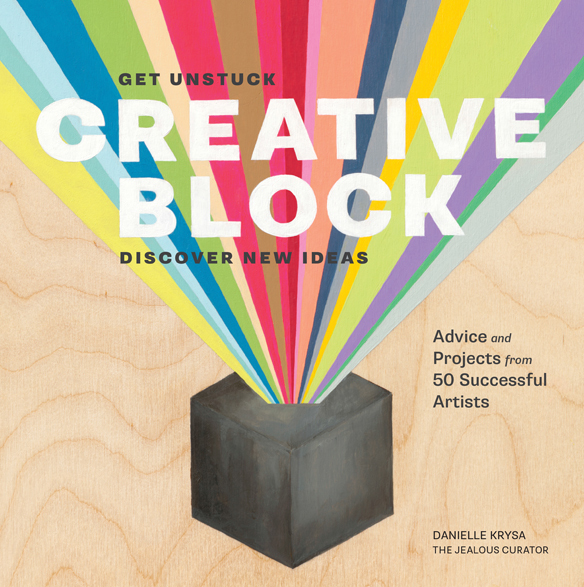 Thanks, Danielle Krysa, for compiling a book so chock-full of great art by articulate and generous artists that I’m buying a rotisserie chicken for dinner tonight (instead of cooking) so I can keep working on my Creative unBlock #04 found-art sculpture exercise.